The kernel, although it is the heart of an image processing filter, becomes an image unit only after it is properly packaged as a plug-in. Your most important tasks in the packaging process are to copy your kernel routine (or routines) into the kernel skeletal file provided by Xcode and to modify the code in the in the implementation and interface files for the filter. There are a few other housekeeping tasks you’ll need to perform to correctly categorize the filter and to identify your image unit as your product. You’ll also need to describe its input parameters. A color inversion image unit that uses the kernel routine discussed in Color Inversion. It uses one sampler object and does not require a region-of-interest method. A pixellate image unit that uses the kernel routine discussed in Pixellate. It uses one sampler object and requires one region-of-interest method. A detective lens image unit, which uses the two kernel routines discussed in Writing Kernel Routines for a Detective Lens . It uses requires several sampler objects and two a region-of-interest methods. Before you follow the instructions in this chapter for writing the Objective-C portion of an image unit, you should understand how the kernel routines discussed in Writing Kernels work. Xcode provides a template that facilitates the packaging process. To help you package an image unit as a plug-in, Xcode provides the skeletal files and methods that are needed and names the files appropriately. 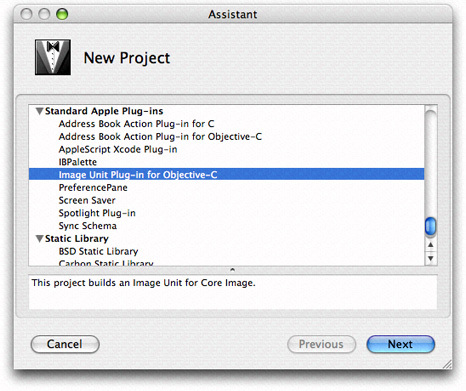 Figure 3-1 shows the files automatically created by Xcode for an image unit project named DetectiveLens. <ProjectName>Filter.m is the implementation file for the filter. You will need to modify this file. <ProjectName>Filter.h is the interface file for the filter. You will need to modify this file. <ProjectName>FilterKernel.cikernel is the file that contains the kernel routine (or routines) and any subroutines needed by the kernel. The default code is a funHouse kernel routine and a smoothstep subroutine that’s used by funHouse. (This subroutine is not the same as the one provided by OpenGl Shading Language.) All you need to do is completely replace this code with the kernel routine (or routines) that you’ve written (as well as tested and debugged) and any required subroutines. <ProjectName>PlugInLoader.m is the file that implements the plug-in protocol needed to load an image unit. You do not need to make any modifications to this file unless your product requires custom tasks on loading. This chapter does not provide any information on customizing the loading process. It assumes that you’ll use the file as is. <ProjectName>PlugInLoader.h is the interface file for the plug-in loading protocol. <ProjectName>.plugin is the plug-in that you will distribute. When you create the project, this file name appears in red text to indicate that the file does not yet exist. After you build the project, the file name changes to black text to indicate that the plug-in exists. The default template file is shown in Figure 3-2. Xcode fills in the filter name for you based on the project name that you provide. You need to make changes to the filter categories and localized display name. The filter categories should include all the categories defined by the Core Image API that apply to your filter. For a list of the possible categories, see CIFilter Class Reference. Info.plist contains properties of the plug-in, such as development region, bundle identifier, principal class, and product name. You’ll want to modify the bundle identifier and make sure that you define the product name variable in Xcode. The default code is for a filter that mimics the effect of a fun house mirror. You should recognize the kernel routine as the same one discussed in Listing 2-6. The project will build as a valid image unit without the need for you to change a single line of code. The filter interface and implementation files provided by Xcode are the ones that you need to customize for your kernel routine (or routines). 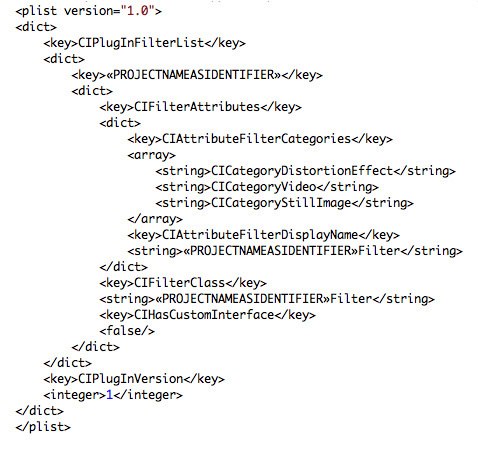 The interface file declares a subclass of CIFilter. Xcode automatically names the subclass <ProjectName>Filter. For example, if you supply InvertColor as the project name, the interface file uses InvertColorFilter as the subclass name. The default interface file declares four instance variables for the filter: inputImage, inputVector, inputWidth, and inputAmount, which, from the perspective of a filter client, are the input parameters to the filter. You may need to delete one or more of these instance variables and add any that are needed by your image unit. init gets the kernel file from the bundle, and loads the kernel routines. Unless you require customization at initialization time, you may not need to modify this method. regionOf:destRect:userInfo is callback function that defines the region of interest (ROI). If you are writing a filter that does not require an ROI, you can delete this method. If you are unsure of what an ROI is, see Core Image Programming Guide and Region-of-Interest Methods. In general, filters that map one source pixel to one destination pixel do not require an ROI. Just about all other types of filters will require that you provide an ROI method, except certain generator filters. customAttributes is a method that defines the attributes of each input parameter. This is required so that the filter host can query your filter for the input parameters, their data types, and their default, minimum, and maximum values. You can also provide such useful information as slider minimum and maximum values. When a filter host calls the attributes method, Core Image actually invokes your customAttributes method. If your filter does not require any input parameters other than an input image, you can delete this method. outputImage creates one or more CISampler objects, performs any necessary calculations, calls the apply: method of the CIFilter class and returns a CIImage object. The exact nature of this method depends on the complexity of the filter, as you’ll see by reading the rest of this chapter. Note: A multipass filter is one that either applies two or more kernel routines or applies the same kernel routine more than once before returning a CIImage object from the outputImage method. Creating a Color Inversion Image Unit uses one kernel routine but does not need an ROI method. Creating a Pixellate Image Unit uses one kernel routine and an ROI method. Creating a Detective Lens Image Unit is a multipass filter that uses two kernel routines and an ROI method for each kernel routine. A color inversion filter represents one of the simplest image units that you can write. It uses the kernel routine discussed in Color Inversion. If you take a look at the kernel routine shown in Listing 2-1 you’ll see that the routine does not use any input parameters other than an input image. So there is no need to supply a customAttributes method. The kernel routine maps one source pixel to a destination pixel that’s at the same coordinates as the source pixel. As a result, there is no need to supply a method that calculates an ROI. You will need to make modifications to the filter interface file and to the outputImage method in the filter implementation file. The default init method will work as is, provided that you do not rename any of the files that Xcode automatically names for you. 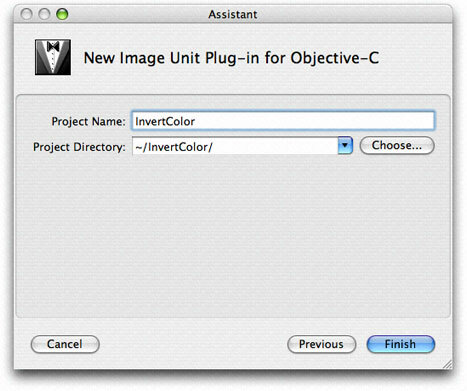 In the Assistant window, scroll to to Standard Apple Plug-ins, select Image Unit Plug-in for Objective C and click Next. Enter InvertColor as the project name and click Finish. Open the InvertColorFilterKernel.cikernel file and replace the code with the code from Listing 2-1. Open the InvertColor.h file and delete all the instance variables except for inputImage, as this filter doesn’t have any input parameters other than an input image. Then save and close the file. Open the InvertColor.m file and delete the regionOf:destRect:userInfo: and customAttributes methods. Save and close the InvertColor.m file. Save and close the Description.plist file. You’ll want to provide localized display names for all input parameters and for all languages that represent your image unit users. Save and close the Description.strings file. It should succeed unless you’ve introduced some typographical errors. Find the InvertColor.plugin file in your project. If you want, move it to a convenient location for validation and testing purposes. Install the validated image unit in /Library/Graphics/Image Units/. That’s all there is to building an image unit for a simple filter! Read the next sections to create image units for more complex filters. Writing an image unit to package the pixellate kernel routine (see Pixellate) is a bit more challenging than packaging the color inversion kernel routine because you need to supply a region-of-interest method. Recall that the pixellate kernel routine uses many pixels from the source image to compute the value of each destination pixel. The number of pixels is defined by the dot size. For example, if the dot size is 4, then the kernel routine uses 16 pixels from the source image: a 4-pixel-by-4-pixel grid. The calculation works well unless the destination pixel is at the edge, in which case there won’t be enough pixels to fetch. That’s where the region-of-interest method comes to play. If the grid of pixels is always inset by the radius of the dot size, you’ll avoid the problem of not having enough pixels to fetch. The code in Listing 3-1 is a region-of-interest method that calls the Quartz function CGRectInset. This function returns a rectangle that is smaller or larger than the rectangle passed to it. In this case, the ROI method insets the rectangle passed to it by the dot radius. Now that you’ve seen the required region-of-interest method, you are ready to use Xcode to create the pixellate image unit. Enter Pixellate as the project name and click Finish. Open the PixellateFilterKernel.cikernel file and replace the code with the code from Listing 2-4. Open the Pixellate.h file and modify the interface so that the filter has two instance variables: inputImage and inputScale. Then save and close the file. Open the Pixellate.m file and modify the regionOf:destRect:userInfo: so that it is the same as the method in Listing 3-1. Save and close the Pixellate.m file. Find the Pixellate.plugin file in your project. If you want, move it to a convenient location for validation and testing purposes. You can optionally install the image unit in "User"/Library/Graphics/Image Units/ although you may need to create the /Graphics/Image Units/ folder because it is not created by default. . The detective lens image unit is the most challenging image unit in this chapter because it brings together two kernel routines and uses them along with a Core Image built-in filter. This image unit requires four CISampler objects and two region-of-interest methods (one per kernel routine). This section assumes that you’ve read Writing Kernel Routines for a Detective Lens . Make sure that you understand the detective lens definition (see Detective Lens Anatomy) and the kernel routines needed for this image unit (see Listing 2-7 and Listing 2-8). Note: The detective lens image unit discussed here is the same as the lens image unit provided in the CIAnnotation sample application. (See /Developer/Examples.) The CIAnnotation application passes a downsampled image to the lens image unit. Then, it passes a magnification factor to the lens image unit that allows the downsampled image to be magnified to its full resolution when underneath the lens. The detective lens filter is a multipass filter. You’ll need to first apply the lens kernel routine to the input image. Then you need to apply the lens holder kernel routine. Finally, you’ll need to composite the output images from each kernel routine. For this you’ll use the Core Image filter CISourceOverCompositing. Note: A multipass filter is one that either applies more than one kernel routine or that repeatedly applies the same kernel routine. Enter DetectiveLens as the project name and click Finish. Open the DetectiveLensFilterKernel.cikernel file and replace the code with the code from Listing 2-7 and Listing 2-8. Open the DetectiveLens.h file and modify the input parameters so they match what’s shown in Listing 3-2. Then save and close the file. Open the DetectiveLens.m file. There are many modifications that you’ll need to make to this file. You need one CIKernel object for each kernel routine that the image unit uses. You need one CIImage object for each image. Recall that the lens kernel routine uses a highlight image and the lens holder kernel routine uses a material map. The input image is part of the interface declaration for the filter because it’s provided by the filter client. In contrast, the highlight and material images need to be included as part of the image unit. Modify the init method so that it opens the files that contain the highlight image needed by the lens kernel routine and the material map needed for the lens holder kernel routine. Add the following lines of code to the init method. You need to modify the file names and extensions if they don’t match what’s shown (myMaterial.tiff and myHighlight.tiff). For each file, the code gets the string that defines the path to the file. Then it creates an NSURL object from that path name. Finally, the code supplies the NSURL object to the imageWithContentsOfURL: method of the CIImage class, and retains the image so that it can be used later. Write a region-of-interest method for the lens holder kernel routine. Recall that the region-of-interest method returns the rectangle that specifies the region of the sampler to use for fetching image data for the kernel routine. The region of interest for the lens holder kernel routine is simply the rectangle that specifies the size of the material map. This method is a callback that’s invoked by Core Image whenever your kernel routine needs a sample for processing. The lens holder kernel routine uses only one sampler, whose sampler index is 0. (Sampler indexes for an ROI method start at 0 and are sequential.) If the sampler index is 0, then the ROI method should return the size of the material map. Otherwise, it needs to return the destination rectangle that Core Image passed to the routine. The userInfo parameter for any region-of-interest method is what you use to pass any necessary data to the method. This particular region-of-interest method needs to have the sampler for the material map passed to it so that the ROI method can determine the size of the map. The extent method of the CISampler class does just that. Write a region-of-interest method for the lens kernel routine. This method is a bit more complex than the one for the lens holder kernel routine. Sampler 0 fetches samples from the downsampled image (that is, what appears as unmagnified—the pixels outside the lens). The region of interest is simply the rectangle passed to the ROI method. Sampler 1 fetches samples from the high resolution image. The region of interest depends on the magnification and width of the lens. The number of pixels needed from the source image is defined by the width of the lens divided by the magnification. The origin of the rectangle that defines this area is the center of the lens minus the number of pixels needed. Sampler 2 fetches samples from the highlight image. The region of interest is a rectangle (CGRect data type) that describes the size of the highlight image. You can obtain the size using the extent method of the CISampler object. The userInfo needed for this particular region-of-interest method is an array that contains three of the filter input parameters (center of lens, width of lens, magnification factor) and the CISampler object for the highlight image. return R; // If the sampler is 0, ROI calculation is not needed. Creates CISampler objects, performing any necessary set up work for them. Calculates any values needed by the ROI method or by the kernel routine. This includes calculating the rectangle that defines the shape of the destination image (otherwise known as the domain of definition). Sets up the userInfo data needed by the ROI method so that is can be passed as an option (kCIApplyOptionUserInfo) to the apply: method of the CIFilter object. Sets the ROI method to use for the kernel routine. Calls the apply: method of the CIFilter object. Then the method composites the resulting images into a final image by using the Core Image CISourceOverCompositing filter. The method is rather long and performs many tasks, so you’ll want to read the detailed explanation for each lettered line (a, b, c, and so on) that appears following the code. 1. Creates a CISampler object for the source image. 2. Creates a CISampler object for the highlight image. 3. Creates a CISampler object for the magnified source, using the transform calculated in the previous lines of code. 4. Extracts the diameter of the lens as a float value, then calculates the radius. 5. Computes, along with the next three lines of code, the rectangle that will be used later to compute the size of the destination image—the domain of definition. 6. Retrieves the size of the highlight image. 7. Creates a CIVector object that contains the size of the highlight image. 8. Sets up the array that’s passed as the userInput parameter to the region-of-interest method. Recall that the ROI method takes three of the filter input parameters (inputCenter, inputLensDiameter, and inputMagnification) as well as the CISampler object for the highlight image. 9. Sets the region-of-interest method for the lens CIKernel object. This is the method that Core Image invokes whenever your lens kernel routine requires a sample. 10. Applies the lens kernel routine to the input image, supplying the necessary input variables, the domain of definition, and the array that’s needed by the ROI method. Note that the domain of definition is specified as a CIFilterShape object that is the union of the previously calculated rectangle (see e) and the domain of definition of the CISampler object for the source image. 11. Creates a CISampler object for the material map needed by the lens holder kernel routine. 12. Extracts the width of the lens holder as a float value. 13. Calculates, along with the next three lines of code, the rectangle that is used for the domain of definition. Notice that this rectangle encloses the lens holder. Core Image will use this information to restrict calculations. The lens holder kernel routine won’t be called for any pixel that falls outside this rectangle. 14. Retrieves the size of the material map. 15. Creates a CIVector object that represents the width and height of the material map. 16. Sets the region-of-interest method for the lens holder CIKernel object. This is the method that Core Image invokes whenever your lens holder kernel routine requires a sample. 17. Applies the lens holder kernel routine to the material map, supplying the necessary input variables, the rectangle the defines the domain of definition, and the CISampler object for the material map (passed as the userInfo parameter). 18. Creates a filter object for the Core Image CISourceOverCompositing filter, supplying the image produced by the len holder kernel routine as the foreground image and the image produced by the lens kernel routine as the background image. 19. Returns the value associated with the outputImage key for the filter. Save and close the DetectiveLens.m file. Select Project > Add to Project to add the highlight image file (myHighlight.tiff) to the project. The name and file type must match what you provide in the init method. Select Project > Add to Project to add the material map file (myMaterialMap.tiff) to the project. Change the display name (look for the key CIAttributeFilterDisplayName) from DetectiveLens to Detective Lens. 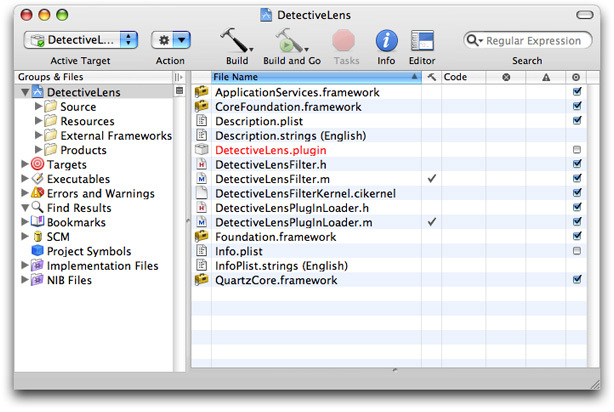 Find the DetectiveLens.plugin file in your project. If you want, move it to a convenient location for validation and testing. Make sure the image unit is valid and works properly by following the instructions in Validating an Image Unit and Testing an Image Unit. If you’ve successfully created all the image units in this chapter, you might try modifying the detective lens image unit by adding a handle that’s typical of a detective lens!